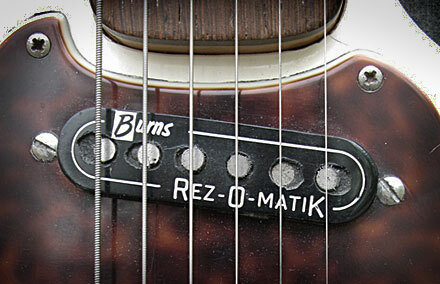 The original Burns Rez-O-Matik pickups were an air coil with an American Alnico III magnets. 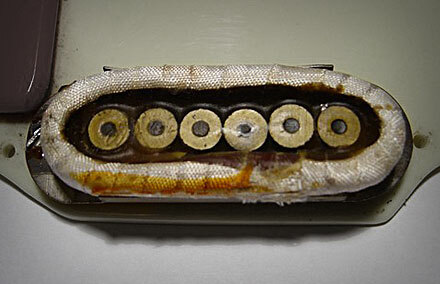 The coils are wound on a collapsible former. Once the coil is wound to spec, the former is collapsed from the inside, and the coil is taped completely. Then its put into the cover with the magnets, and then the whole thing is epoxied so it won’t be microphonic. The coil is very thin top to bottom, and there is no bobbin. The power and punch of a Alnico III magnet is used to produce a sweet, full-sounding tone, characterized by tight lows, light mids, and airy highs – somewhere between the quack of a single coil and the growl of a p-90. And as a result of the higgledy-piggledy chaos of directions in which the coil wires point, the Burns Rez-O-Matik has a richer harmonic content than any pickup wound in a more disciplined way.